How to speak of Dr. Strangelove? To clarify I mean the film and not the character. First and foremost, it’s one of those films that has so much significance, because of the era it came out of and for the way it represents that time and space. It’s the defining film about the Cold War, much in the same way All the President’s Men is identified with Watergate and the sentiments at the time. This film is wickedly funny, and yet I never found myself laughing out loud. There was more often a smirk slowly forming on my face. This film is a landmark and an important piece of cinema and yet I could never say I have a passionate love for it. What sets it apart is the way that Kubrick is able to tackle the paranoia at the time. His plot is utterly ridiculous and absurd and yet in anything, there is always a sliver of truth that seems all too real. A film throwing around talk of nuclear war and doomsday devices is rather bleak and so I suppose Dr. Strangelove is a type of morbid humor. Certainly a black, satirical comedy. The order was given on the command of a General Jack D. Ripper (Sterling Hayden) after he ordered his aide British officer Lionel Mandrake (Peter Sellers) to put their base on high alert. All this came about because of Ripper’s fears about fluoridation and bodily fluids. He’s sure the Commies have infiltrated and so he prepares to decimate them. He bypasses the president, all communication is cut off, and he locks himself and Mandrake up in his office. As far as he’s concerned the deed is done. He can just go on chomping on his cigar while comforting Mandrake. Because there’s no way that he would ever disclose the three-letter code so his aide can warn the Pentagon. The final setting of the film takes place in the legendary war room which feels rather like a velodrome with a table in the center. There the highest officials of the nation gather round to try and figure out what to do about this national crisis. General Buck Turgidson (George C. Scott) advises the president on what to do about the situation while chewing away at a wad of gum. President Merkin Muffley (Sellers once more), is far from pleased and he even sends a call over “the hotline,” to the Russian Premier. He shares his deep regrets about the situation with Dimitri and it gives Seller a stage on which to work his deadpan humor. Muffley also tries to maintain order after Turgidson and the Russian Ambassador get in a scuffle (Gentlemen, you can’t fight in here! This is the War Room!). Meanwhile, a battle ensues at Ripper’s base as the apt billboard inscribed “Peace is our Program” sits in the background. This is an utterly ludicrous firefight and it ends with an appearance by Keenan Wynn ready to take Mandrake and Ripper captive. However, the general has already kicked the bucket and Mandrake attempts to use a payphone to reach the Pentagon. But the best advice the president gets comes from Nazi-defector Dr. Strangelove (Sellers number three), who is restricted to a wheelchair and still has trouble stifling his “Heil Hitler” and “Mein Fuhrer.” His final solution is to gather a few hundred people in mine shafts underground, away from the radiation, where they can procreate. The female to male ratio optimally would be 10:1 and that starts Turgidson salivating. We don’t quite know how it ends, but Kubrick ends with the iconic juxtaposition of nuclear bombs exploding as “We’ll Meet Again” wafts through the air. It’s the last brilliant piece of humor. 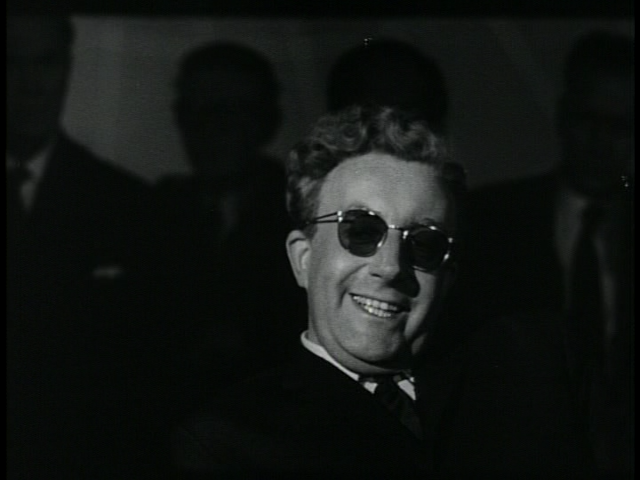 Dr. Strangelove is a great film in part because of its performances beginning with Seller. We’re used to his lovable buffoon Inspector Clouseau and yet he’s quite different here. Each character is starkly different in fact, but each one is played straight with their assorted quirks laid out for us. Slim Pickens, a man also known for his comedic sidekick roles is playing it straight which is also funny in itself. Finally, George C. Scott is one of the stars that we would label a dramatic actor and yet this is probably the most over the top and odd performance of his career. It’s wonderfully vibrant in all respects from the gesticulation of his body to his facial expressions. Everything’s an odd mix where hysteria with global consequence is matter-of-fact. There’s no fighting in war rooms. There are Cold Wars and Hotlines. Nazi Doctors advise the president and Russian ambassadors are tackled to the ground. It’s pointing to the inconsistencies in this world that we live in. It’s a satire about the absurdity of nuclear deterrence in an age where that was in vogue. This entry was posted in 1960s, Comedy, Drama and tagged Cold War, George C. Scott, Great Film, Keenan Wynn, Nuclear, Peter Sellers, Review, Satire, Stanley Kubrick, Sterling Hayden by 4StarFilmFan. Bookmark the permalink. I do love this film also. Nice review.